Enable Web Server – On. Allow other users are connected – On. 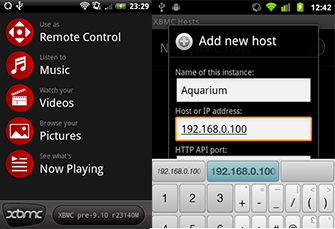 WMC green button on remote control to start XBMC, you can use this program XBMC Launcher_v4.1. Simply install the button and Windows Media Center will now load XBMC. Warning! XBMC Launcher runs on both Windows 7 and in Windows 8. The previous version, only for Windows 7, you can download here .